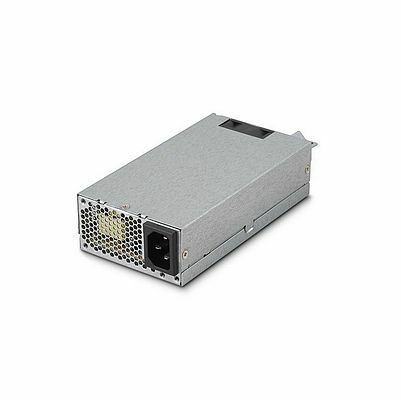 Tumbler Technologies + TRUMPower introduces the 400W TIPC400-FXG, which has a height of 1.59 inches that makes the PC power supply ideal for 1U and confined space applications such as POS, small-size server station and Mini-ITX small form factor systems. The TIPC400-FXG, featuring 90-264 VAC full range input and active PFC, is approved by UL, cUL, and TUV to the latest 2nd edition EN/IEC/UL 60950-1 ITE safety standards. MTBF at full load is higher than 150K hours at 25°C ambient, calculated per MIL-HDBK-217F. The power supply complies with EMI/EMC standards, including FCC & CISPR 22 Class B conducted, FCC & EN 55022 Class B radiated. The unit also carries CE marking and is RoHS compliant as well. The power supply consists of DC voltage outputs and maximum loads of +3.3V/16A, +5V/16A, dual +12V/18A, -12V/0.5A, +5Vsb/3A, and optional -5V/0.2A output. The maximum overall output is 400W, with +3.3V and +5V providing a maximum power of 120W. Measuring 190 x 81.5 x 40.5mm (7.5 x 3.2 x 1.6 inches), the unit includes a standard output cable-set that can meet the requirements of most applications.